There was a lot of talk at June's Society for Imaging Informatics in Medicine (SIIM) conference about raising radiology's profile. It seems that all of the buzz about value-based care has added fuel to the thinking about radiology's role in the wider medical enterprise. Not that people haven't been talking about this for a long time, but it was a key aspect of every session I attended; several attendees also mentioned that the message was much more up front this year than in past years. From improving consultation between radiologists and referrers to using social media to connect with medical and local communities—even to actively participating in patient care—communication and collaboration were two of the most-heard words throughout the conference. This issue has a few articles that fit right in with those themes. 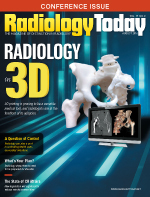 Our cover story, written by Radiology Today Assistant Editor Tony Fioriglio, takes a look at the ways 3D printing is changing health care. Radiology images are central to medical 3D printing, in all of its uses, and the specialty offers a new avenue for radiologists to employ their unique skills. After all, converting DICOM files to Standard Tessellation Language requires expertise, and who better to do it than the people who have been at the forefront of medical informatics from the beginning? But, as Fioriglio writes, radiologists would do well to build on their head start and make sure that they continue to be an integral part of the 3D printing process, or they run the risk of ceding influence to other specialties. Another area where radiologists and technologists can assist the broader enterprise is in preventing health care–associated infections, which occur at a rate of approximately 722,000 a year in US acute care hospitals; more than 10% of those infections result in death. Jeannette Sabatini investigates the hidden and not-so-hidden areas in radiology and IR departments where harmful microbes lurk. Infection prevention may not be the first thing that leaps to mind when you think about medical imaging, but mitigating infection risk can significantly benefit patients and providers. Also in this issue, Beth W. Orenstein reports on best practices for medical imaging disaster recovery plans—another enterprisewide concern—and Keith Loria covers the changing landscape for CR systems.